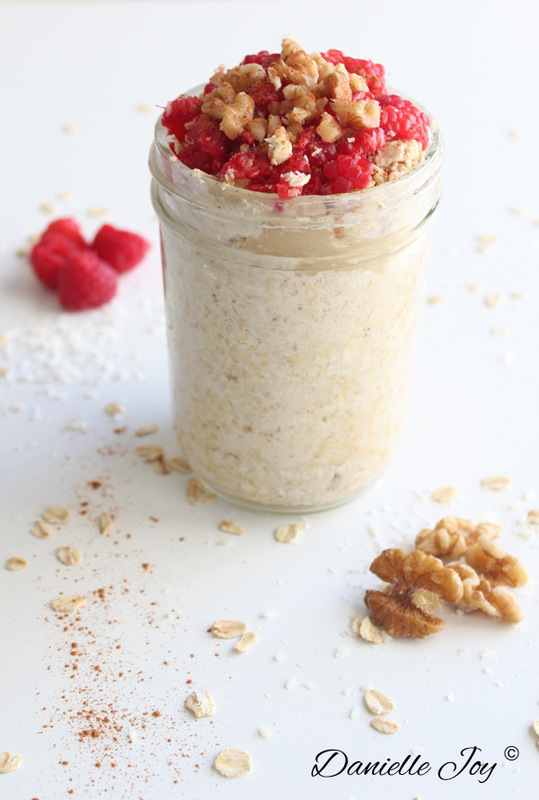 Overnight Oats with Raspberries and Tahini - Your process has a purpose. This simple & quick recipe of mouth-watering overnight oats contains raspberries, which are very high in vitamin C, and tahini — a paste of sesame seeds — which is high in copper, to keep your blood & bones healthy. Tahini has a higher protein content than most nuts, keeping you satisfied for longer. The bitter tahini & tangy raspberries provide an amazing contrast of flavors which goes splendidly well with the sweet banana. I start craving this breakfast just thinking about it! In the morning, add all other ingredients to the bowl. *Though soaking is beneficial, you can make this recipe in the morning without soaking as well. I really like the idea of this, it looks beautiful too! I want to branch out with my use of tahini – I’ve used it in a raw caramel slice and it was really good. My blender has been sent in for fixing this week, so I haven’t been able to have my morning smoothies and have hit a bit of a breakfast rut. Am definitely going to try this now, looks like a great way to start the day!